We've just tried the Grand Pitstop GRoller that weighs just 1.4kg, is compact enough to be packed into your saddlebag and promises to replace a paddock stand to rotate your bike's tyre or lubricate the chain. Featured here is the GRoller L, the largest sized unit that can be used with motorcycles weighing up to 270kg and with a tyre width of up to 240mm. It uses two stainless steel rollers with ball bearings inside. We used it on the Indian Scout Sixty that weighs 254kg and has a 150-section rear tyre. Using it is easy and can be done by one person alone. 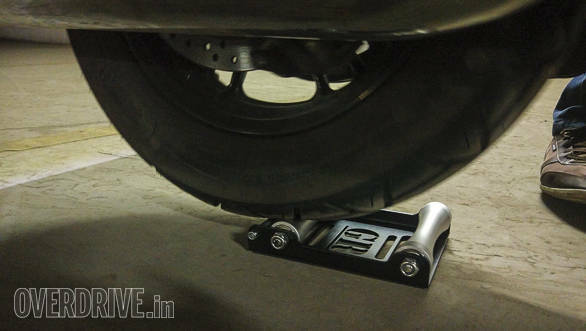 All you need to do is place the GRoller under the motorcycle and move the bike forward to position the rear wheel onto it. The GRoller has two rubber strips underneath to prevent it from skidding. Once in position, lean the bike on its side-stand and you can rotate the rear wheel manually. The wheel shifts slightly when first rotated as it is angled to one side but rotating it thereafter is not an issue. 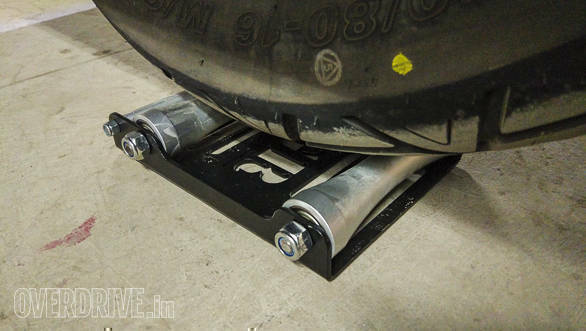 It calls for some effort to rotate the wheel, but the GRoller is small enough to be carried on road trips to repair punctures on the go or use at home. It is available in three sizes  small, medium and large. Quality of construction and finishing are good and the rollers are made of high-grade stainless steel and should not rust. A handy tool, especially if you own a motorcycle without the main stand.